Guilty. This is a difficult word for a criminal defense attorney to hear. It hurts when a clerk stares into the pit of the courtroom and makes guilt true by its very declaration. Not long ago, I represented a man accused of seven terrorism crimes. My trial team and I felt that our client was innocent, so the clerk’s booming, stoic repetition of the word “guilty” crushed me. I suspended my law practice and hid myself away in graduate school. Why would Auster expect that meeting his grandson would change his father? Why would I expect a Muslim man who hurt no one to receive a fair trial? Was the fault not ours – for expecting? Auster and I could have just tossed our stories into a well of disappointment, but we didn’t. We couldn’t. I read Auster’s book The Invention of Solitude with bated breath when my advisor, Harvard Divinity School professor Michael D. Jackson, recommended it to me. It turns out that my connection to the book was deep. Like Auster, I also wrote a book about trying to know my father. I realized in graduate school that my feelings over losing that terrorism trial had to do with my father’s life story, a story he had never before shared about how he left the farmlands of rural India and became a physician in America. Though my relationship with my father was one of presence and warmth, I was confounded by how my father could parent that way given how he grew up. Auster’s book helped me connect that past to my life. The second essay in the book, entitled “The Book of Memory,” explores a third person narrator’s relationship with his son, the loss of his grandfather, and how he negotiates the solitary writing life. The narrator is ostensibly Auster himself. He begins the essay with these two sentences: “It was. 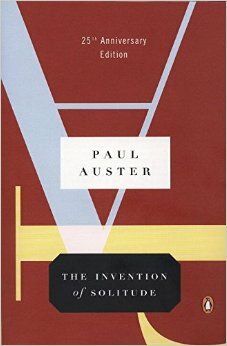 It will never be again.” Auster explores memory in this essay – what its retrieval and the making of it means. He notes, as do essayists like Hannah Arendt, Michael D. Jackson, and Leslie Jamison, that life is solitary, yes, but interconnected in its solitary nature: “Memory, therefore, not simply as the resurrection of one’s private past, but an immersion in the past of others, which is to say: history – which one both participates in and is a witness to, is a part of and apart from.” Invoking the examples of Michelangelo and Collodi’s Pinocchio, Auster tells us that the acts of retrieving memories and writing about them helps us to hew away at the excess matter of life, to reveal the true form of who we are. “It was. It will never be again. Remember,” the essay ends. If life is a cascading reel of images, scene by scene, we can narrate our stories with greater context and compassion when we have more images to work with. Those memories can be happy and painful. But Auster writes that when we wander through our memories, we have walked in the world. In the quiet, solitary occupation of writing, we have elevated the seemingly final into something we are brave enough to question and ultimately live with. Sejal H. Patel is a San Francisco based criminal defense attorney and writer. A graduate of Northwestern Law School and Harvard Divinity School, her essays are forthcoming or have appeared in The Rumpus, Creative Nonfiction, Harvard Divinity Bulletin, and her blog. She is at work on a memoir entitled Seven Almonds about how researching her father’s history as a poor farmer in rural India as a graduate student renewed her faith in the criminal justice system.